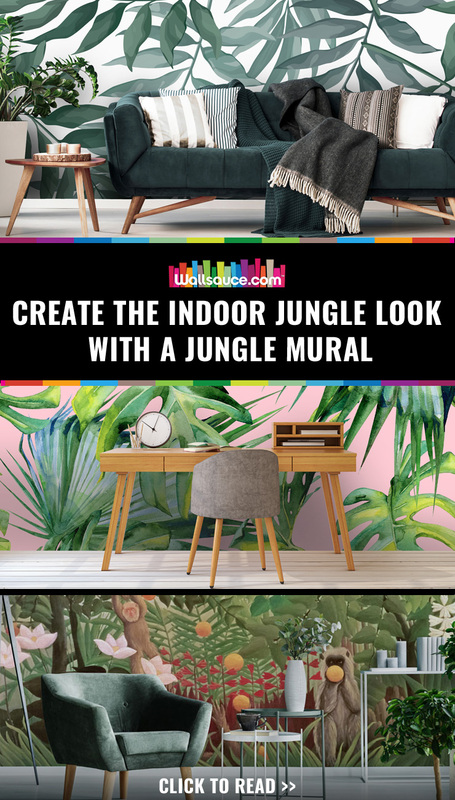 Create a unique setting for your home, office or retail space with a fantastic jungle mural look. 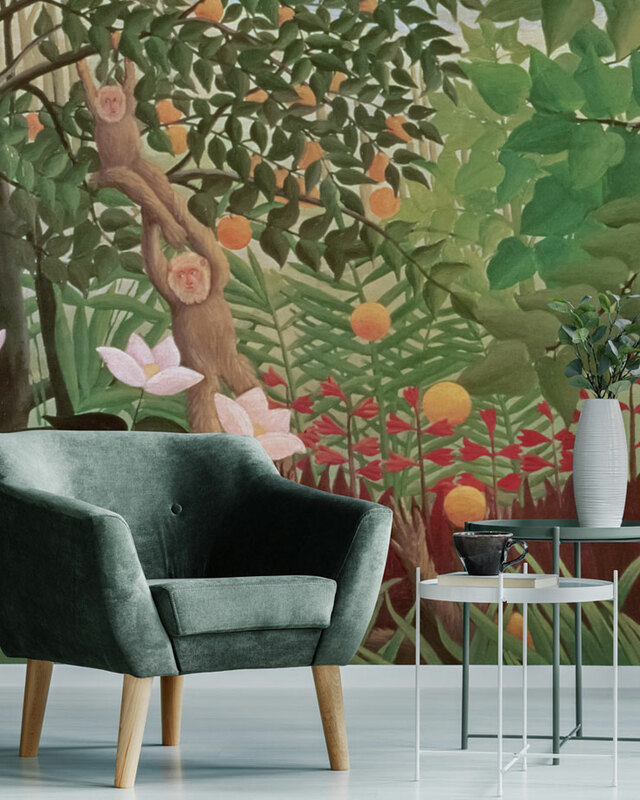 A growing trend over the last few years, the urban jungle interior utilises bold wallpaper with plant and wildlife motifs to bring any dull space to life before your eyes. Relax in the rainforest or stand in awe at the eclectic wildlife peeking out through the bushes. A wandering sense of adventure mixed with the calming tones of the jungle backdrop is certain to give you, your staff and your clients the perfect environment to thrive. Go on an adventure with our range of forest-inspired wallpapers, walk through the trees to discover whole new worlds of beauty and life. Or simply relax with the soothing tones and elegant styles of leaves and foliage. 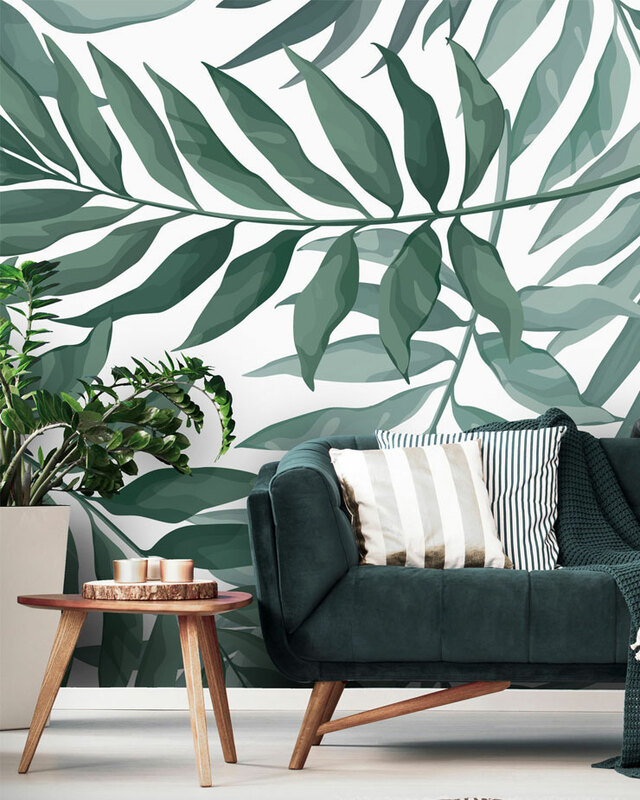 For all you nature lovers out there, the jungle mural look is a perfect interior decoration for your living room, hallway or bedroom. With a vast selection of incredible backdrops available, from vast rainforest to beautiful flora, and even majestic tigers, show the world your love of nature and bask in the calming wonder of adventure all day long. 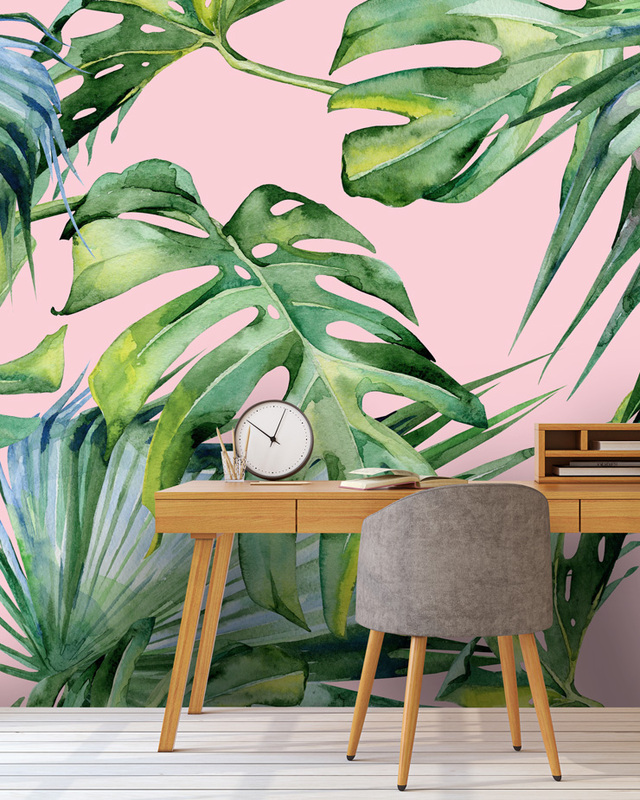 Lose yourself in a modern-day jungle mural with our Pink Jungle wallpaper. Simplicity meets elegance with a touch of the outdoors with this wallpaper, featuring large leaves on a pretty bubblegum pink background - the perfect choice for bedrooms, and even offices. We all wish we could be in the tropics, surrounded by palm trees, coconuts and gorgeous, sandy shores. So, why not make the most of our Palm Tree jungle wallpaper and transport yourself to a world of calm, tranquil palm trees. The layers of leaves blend perfectly with the green tones, creating an almost 3D look for that extra bit of realism. The palm tree wallpaper would be perfectly placed in an office or retail space, to give your staff and customers a relaxed, back-to-basics feel. Take a look at some of our favourite palm tree wallpapers. Indulge your love of wildlife with a bit of colourful fun. The pink flamingoes in this Jungle Print Flamingo wallpaper blend perfectly with the contrasting jungle colours. Soft pinks and greens and blacks all work together to add some pretty in pink personality to any room. The ideal choice for a bedroom or living room, sleep among the flamingos in true jungle style. Delicate and bright, perfect for a retail space or dining room, the Green Leaves Watercolour jungle wallpaper brings an artistic flair to the nature-inspired decadence. In a wonderful watercolour style, the beautiful green jungle leaves sit gracefully on a creamy background, allowing them to take pride of place in the forefront without being overwhelming. With offices across the country often being a dull and dim place to be, with fluorescent lighting and bland decor, it can be almost depressing for your staff. Everybody knows that happy staff are more productive, and the interior design of your office and lunch areas can have a huge impact on the productively and wellbeing of your staff. 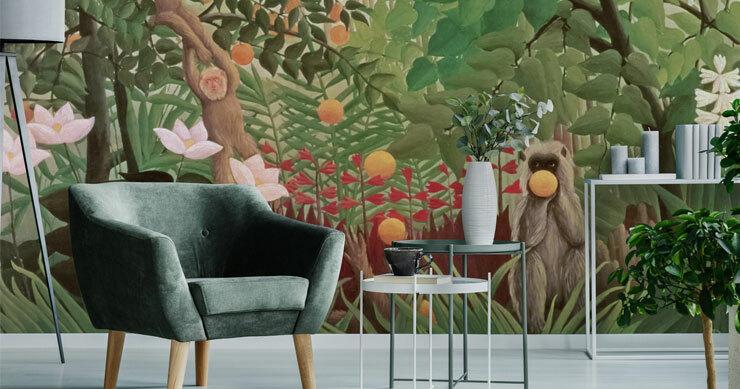 Jungle mural wallpaper can transform the dull and dim into an exciting world of adventure and relaxation - making it the perfect choice for meeting rooms, dining areas, and even main offices. It’s not just company offices that can benefit from a breath of the rainforest - home offices need just as much careful consideration to ensure maximum productivity and wellbeing. A perfectly decorated home office can transform the bland space into a living wonderland - giving you the perfect place to get some work done in tranquillity and calm. Check out some of our other home office design ideas for more inspiration. Create the perfect place to encourage calm, relaxed buying habits with a range of urban jungle looks to choose from. Transport your customers into a whole new world, full of wildlife and foliage, with a wide range of colours and styles to ensure the best possible state of mind as soon as they walk through the door. Give yourself an edge and transform your showroom into a jungle-themed scene. From stoves and fireplaces to beds and even office or living room furniture. Decorate your showroom with jungle scenes, from the fullness of life to the simplistic and elegant, to give your visitors the best environment to appreciate the products on display while relaxing them with a breath of nature and a sense of adventurous wonder. The home is where the heart is - or so they say. So, why not put the heart of the jungle into the heart of your home. With a rich tapestry of foliage, wildlife and palm trees, you can be whisked away to beautiful scenes of excitement or calm after a long day’s work. Relax with a book in the heart of the rainforest, eat amongst the flamingoes or sleep with the beautiful watercolour styles of the jungle foliage. Whether it’s an office, retail space or in the home, creative jungle mural designs can help to release creative inspiration. From the adventurous to the calming, being around nature can not only help us to relax, or give us a sense of wild adventure without having to leave our homes, it can offer inspiration for photographers, writers, artists and even give a new angle for sales staff. Perfectly pair your jungle mural wallpaper with indoor potted plants and a range of bamboo furniture to complete the jungle theme in your home, office or retail space. Use real-life plants for a fragrant realism, giving your staff and customers the true jungle experience by creating beautiful displays, or opt for low-maintenance faux plants for a cost-effective aesthetic effect. Regardless of where you’d like to place your new jungle, the wide range of options available allow you to perfectly match the right wallpaper to the setting of your choice, giving any room or setting a little slice of you. With all the options to choose from, would you prefer a calming, relaxing scene, or something a bit more adventurous? Feel free to leave your suggestions in the comments box below.